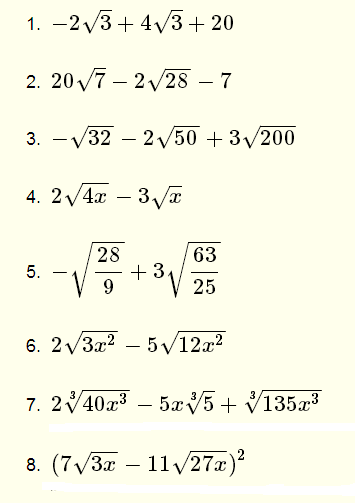 Grade 10 questions on how to add and subtract radicals expressions with solutions are presented. Radical expressions are like if they have the same index and the same radicand. 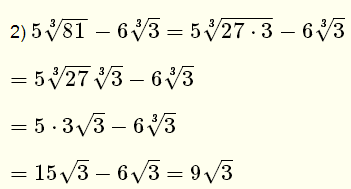 are like radicals because they have the same index (root number which is 3) and the same radicand (number under the radical which is 5.
are not like radicals because they have different radicands 8 and 9.
are like radicals because they have the same index (2 for square root) and the same radicand 2 x. Only like radicals may be added or subtracted. 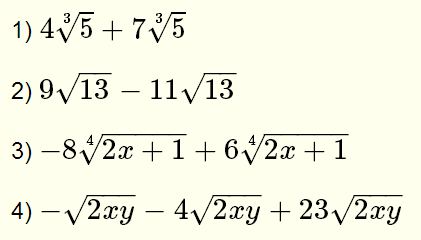 The above expressions are simplified by first factoring out the like radicals and then adding/subtracting. When it is not obvious to obtain a common radicand from 2 different radicands, decompose them into prime numbers. 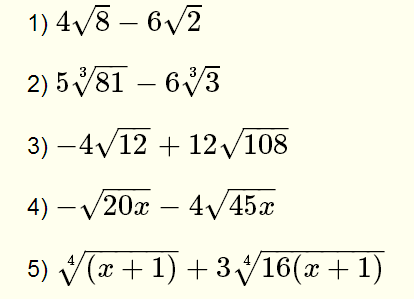 Decompose 12 and 108 into prime factors as follows. 3. The 3 radicands in the given expression -√ 32 - 2√ 50 + 3√ 200 are different but note that 32, 50 and 200 may be written as 2 times a number that is a perfect square as follows: 32=2 * 16, 50=2 * 25 and 100=2 * 100. Substitute in the given expression and simplify.